Would you want to pay for the sewing operators wages whilst they sat idle waiting for the input, or for the rework processes that had to be undertaken because the machine was incorrectly set, or even for the rechecking your shipment due to defects found in final inspection? These wastes are included within the cost of your products, either increasing the cost of product or reducing the profit of the company. Your profit is your FOB/CM price less your costs. If you charge too much then buyer will go elsewhere. Therefore the only way you have to improve your profits are to reduce your costs; this means removing all elements of waste from your processes. In addition to improving your profits you will find that waste has a major impact on your customer’s satisfaction with your products and services. Your customers want on time delivery, perfect quality and at the right price. In the current price competitive market, you cannot make profit if you allow the 7 wastes to persist within your processes. Transport is one of the seven wastes of lean manufacturing (muda), it is the movement of products from one location to another. This could be from the cutting to the stitching floor, or from the production facility to the printing unit in some other location. This transportation adds no value to the product. 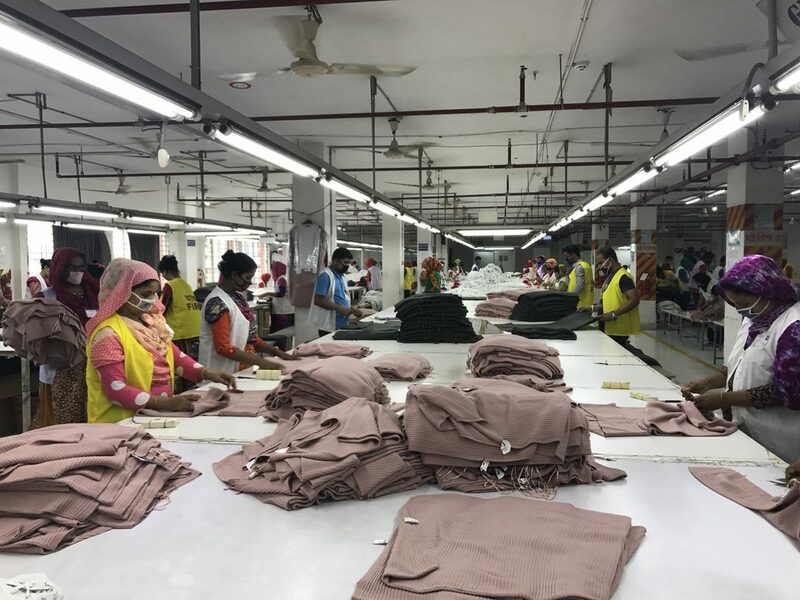 Moving half stitch pcs to a bartack/buttonhole machine in some other line or department or lines, transporting stitched garments from sewing floor to finishing department, Moving garment bundles in the line using center table, bins or trolley. There are few areas where transportation can’t be eliminated but think how transportation time can be reduced. Setting up effective line layout with all required machine, equipment, single pcs moment or using overhead transportation rail in sewing lines are few examples which can reduce the transport time. Big wastes of motion are easily recognizable and are often eliminated through common sense. When the layout of a work area is excessively large, often as a byproduct of overproduction, distances increase, leading to a more wasted motion. The main causes of the waste of motion are with regards to cell layout, placing product at floor level on pallets, poorly arranged space, tools that are disorganized, lack of space and organization for component parts and so on. Resources are wasted when workers have to bend, reach or walk distances to do their jobs. You can see many examples while walking on a Cutting, production or finishing floor. A unorganized tool room or a un indexed accessory store are the best examples of motion waste. Another problem can be the design of your working method, does it cause you to constantly turn and rearrange the product being worked on? Design of the product itself can impact in the same manner. This waste is defined as people or things waiting around for the next action. How many times have you seen sewing operators stood waiting for a previous operation, or there is no work for pressmen in the finishing section, a line sitting idle due to unavailability of cutting, these all are the commonly seen examples of waiting waste. You pay for the time spent by all of your employees, time that they do not spend adding value while they are waiting and often the time spent waiting is made up later during overtime at a premium rate. The cost of the time-spent waiting will come direct from your profit. Producing items more than required at a given point of time is overproduction simple words procuring/producing excess inventories is overproduction. Over producing leads to other types of wastes also. It will lead to excess inventory, which will result in increased material handling and increased men hours and working cost. Sometimes even extra resources will be required to store or move this material. You can easily see this in many garments factories where they stock lots of inventories to feed the next department/operation. For example, you can see a big stock of ready cut panels in cutting department or the excess WIP in lines and finishing department. Excess WIP is one of the major cause of many quality related issues. FIFO (First In/First Out) will become difficult with the extra inventory and this could cause further problems. Most of the time you end up with the poor handling when you have excess inventories and that’s create the most basic but the most commonly encountered problem, stains and dirt marks. Over-Processing Waste is extra effort or activities that add no value from the customer/patient perspective. By adding work that is not required, over-processing costs you money with regards to the time of the workforce. These costs can amount to a considerable sum over a period of time, they will also reduce the output due to reduced efficiencies. Checking the same garment multiple times or adding a operations that may not be essential to give the final look and construction or adding run stitches before final operations to make operator more comfortable instead of training or on machine template are commonly seen over-processing examples in apparel industry. Defects can be caused by many different reasons, It should be avoidable with a little thought when designing your products, processes and equipment. Many defects are caused by incorrect method due to non-standard operations, processes, methods or operators do not assemble them correctly and so on.Fail to maintain equipment, machines and fixtures also allowing defects to occur. In a garment factory the most common defects are stains, broken stitches shade variation, wrong cutting, measurements problems etc.Factory needs to correct/repair these defects, which attracts additional cost.